Who’s been snooping around, looking at your phone? According to one survey from phone security company Lookout, one-third of all respondents admitted to sneaking glances at text messages, photos, and emails on a loved one’s phone. So can you catch them red handed? You bet. Of course you can install a passcode lock to prevent unauthorized access to your device, but wouldn’t it be so much more satisfying to have proof of snooping? It’s easiest to play detective on an Android phone. Install the app HiddenEye, and if someone incorrectly enters your passcode, it snaps a picture. This is all done very stealthily so the snooper has no idea he or she is being photographed. The next time you fire up your phone, the photo gallery will have pictures of anyone who’s attempted to crack your password. You can also set it up so the photos are stored remotely via Dropbox. This adds an added layer of security if your phone is stolen or out of your possession. Lookout, the same company that conducted the prying survey, has their own security product for phones. The basic app that lets you track your phone, lock it remotely (via your computer), and have the phone to take a picture of anyone trying to break the passcode, is free (Premium features, like remote lock and wipe, cost $2.99 a month). Those pictures are automatically uploaded to your web account for remote viewing. This is more of a security feature than a stealthy way to get proof of a phone spy, since the lock screen is branded with the Lookout logo and specifically says it’s locked for security purposes. But it will work at home if you set the trap and your snooper falls for it. On an iPhone the options aren’t as good. The best app is called WhoSnooped. It costs $.99 and is more of a novelty than a forensic tool. It doesn’t run all the time; instead you have to set a trap. You open up the app and then lock your phone, leaving it out for the snooper to find. When they slide the lock screen button, the WhoSnooped app opens up and takes a picture of them while displaying the banner “Stop Snooping.” The snooper could easily delete the photo in the app, leaving you with no proof of intrusion. That said, the app let’s the snooper know they are being watched, and it may deter future attempts. A different idea for the iPhone comes from iTrust. It costs $.99 and unlike the other apps that take a picture of the snooper, iTrust records video of the icons a snooper touches as they attempt to open apps. When we tested it, the playback showed a simulated fingerprint of the snooper trying to open my text messages, photos and address book. Unfortunately the app is a little rough and I’m not sure it would work well in the real world. It asks you to take a picture of your home screen and then you have to fire up the app and leave it running to catch the snooper. Worse, the way the app places the picture of the home screen isn’t quite right; and a wary snooper might put it down immediately when seeing the home screen slightly off center. 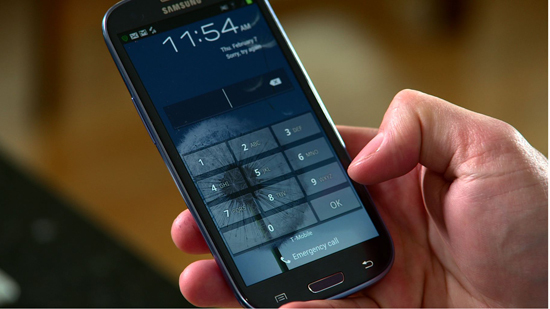 Do you have a secret for catching a phone snooper? We’d like to hear it in the comments or on our Facebook page.